Those who follow us on Facebook and Instagram have already seen a preview of #pabloalmercato, a tour held last Friday in Florence which led us to Palazzo Strozzi, where a wonderful exhibition dedicated to Picasso and other leading Spanish artists has just opened and to the Mercato Centrale (Central Market), a recently renovated Florentine historical market that has become one of the most innovative gastronomic spaces in the city since this late spring. For the exhibition “Picasso and Spanish Modernity” which just opened on Saturday September 20th, Palazzo Strozzi and the Mercato Centrale have formed a special partnership that will surely be greatly appreciated by visitors to both spaces. With “Pablo al Mercato” (Pablo at the Market), the exhibition of Picasso enters directly inside the Mercato Centrale. On the first floor, visitors will be able to admire special posters and drawings that reinterpret the market and its artisans in the style of Picasso – we found them very cool! The collaboration between the museum and the Central Market is not accidental. It actually seems that Picasso was very attracted by the colors and scents of the market (built in 1874 in iron, glass and stone) and that during his visit to Florence in 1949, he was literally fascinated by the stalls of the fishmongers and by the rich shades of color found in their fish. So what can you, the visitor, get out of this partnership? A double benefit! Stop at the Info Point on the first floor of the Central Market and receive a coupon to get 15% off the admittance cost of visiting the Picasso exhibition. 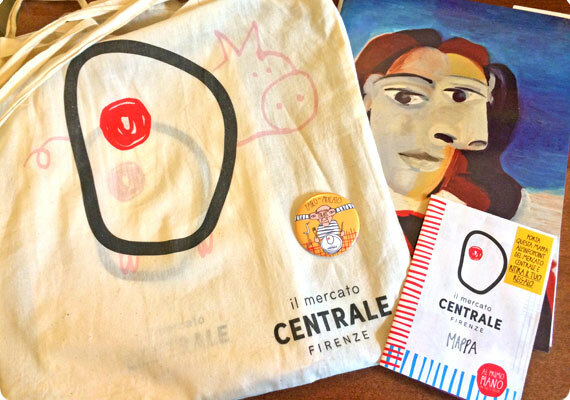 If you’re already at Palazzo Strozzi to visit the exhibit, you can request a special map of the Mercato Centrale at the ticket office which will include a map of the first floor and the Info Point – stop there and show the map, and you’ll receive a special gift! We suggest taking advantage of both, by visiting the market first and enjoying a delicious breakfast, coffee break or lunch, then going to the exhibition and once again return to the market to enjoy its many offerings ;). 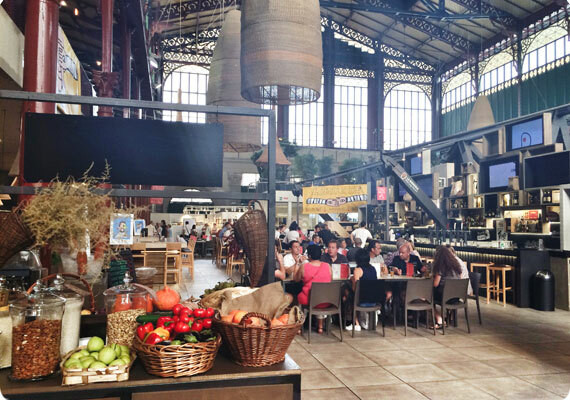 During the tour #pabloalmercato, we were able to see a preview of the Picasso exhibition, then got to taste a superb lunch at the Mercato Centrale that offered a chance to get to know the artisans of the many workshops inside the market and their gastronomic offerings. 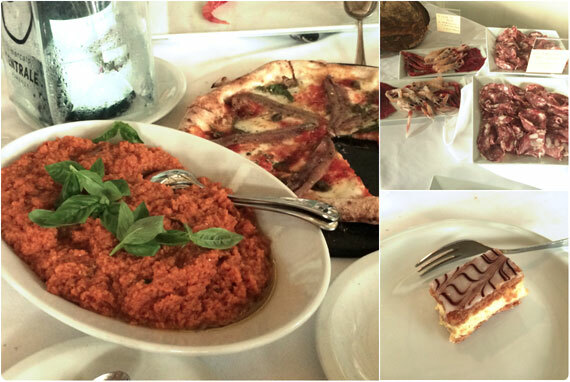 The day was interesting and tasty, the combination of art and food turned out absolutely perfect! 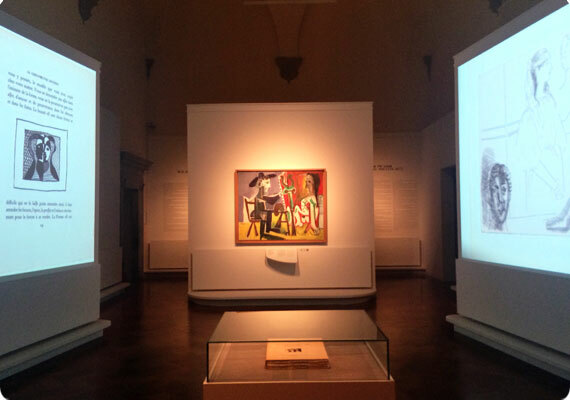 Modern art has returned to Palazzo Strozzi with its new exhibition “Picasso and Spanish Modernity” which will be open to the public until January 25, 2015. The exhibition, curated by Eugenio Carmona, offers visitors the opportunity to retrace the many parts of Picasso’s complex personality through several significant works coming from the Museo Nacional Centro de Arte Reina Sofia in Spain, including some preparatory works for the famous painting Guernica. The important works by Picasso are accompanied by many masterpieces of other Spanish artists of the twentieth century such as Joan Miró, Salvador Dali, Juan Gris, Maria Blanchard (considered the Iberian Frida Kahlo) and Julio Gonzalez. The exhibition is very rich, with over 90 incredible works altogether. 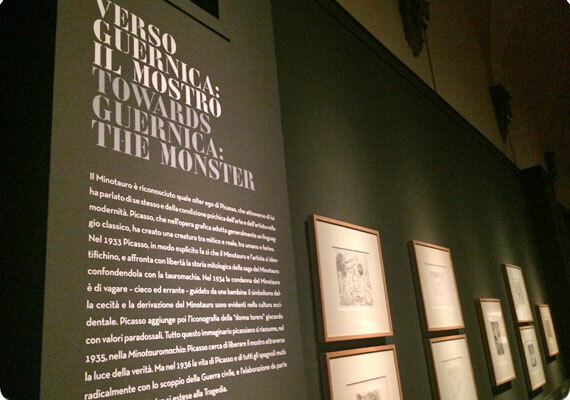 The exhibition at Palazzo Strozzi is open daily, including holidays, from 10am to 8pm (and until 11pm on Thursdays). For more information, you can visit the official website. Opened last April, the first floor of the Central Market is an innovative and ambitious project, which has brought new life to the historic Florentine market. “Pablo al Mercato” allowed us to get to know the twelve “artisans of taste” that every day prepare on site quality food and products, all of which have already conquered Florentines and tourists alike since the re-opening of this space. Besides, to “know more” about the work of the food artisan we had an important task to complete: to taste specialties from all the twelve food shops! Such hard, but oh so wonderful work! 😉 Here’s a sampling of some of the food YOU will also find at the Mercato Centrale’s first floor every day, open daily from 10am to midnight. What did we taste? Delicious smoothies at the fruit and vegetables stall made with their fresh products, sandwich with lampredotto, a Florentine speciality, the pappa col pomodoro (another Florentine specialty), the affettati (a mix of salami and other cured cold cuts) and meatballs for the lovers of Tuscan flavors… as well as fresh fried fish, buffalo mozzarella from Caserta, a very simple but delicious pizza and several sandwiches, a superb selection of cheeses and fresh made bread and fresh pasta made ​​with durum wheat. To finish the meal, several morsels of mouth-watering desserts by Pank. The offering of flavors at the Mercato Centrale is so varied there is something to satisfy everyone and all manner of tastes. The first floor of the Central Market is open every day from 10am to midnight, so there really is no excuses to not visit it during your time in Florence! You can find more details about the market and its food specialties on the official website. Personally, taking part of the blog tour #pabloalmercato was a great experience and combination of art and food. It was also accompanied by some extraordinary, unexpected and really astonishing “special effects“. On Friday, September 19, Florence was hit by a storm of wind and hail that created a surreal scenery throughout the city (in addition to various damages around the city). 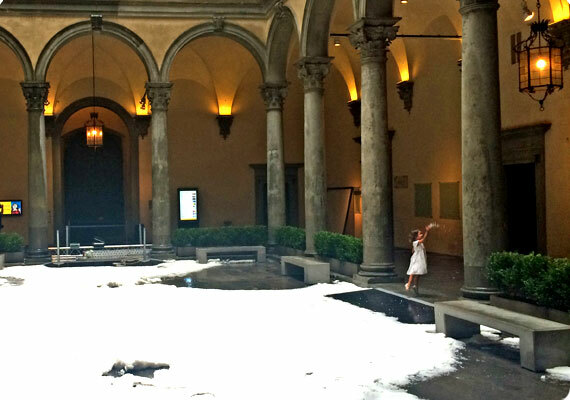 The picture below was taken in the courtyard of Palazzo Strozzi right after the storm: it was covered by a thick carpet of hail, making it seem like snow although the hail was quite large. It was an incredible day, a day we will certainly remember for a long time!